I just wanted to put up a quick post. 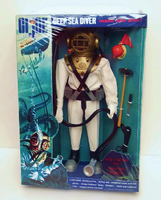 After much time taken to get these right, I am currently selling these classic GI Joe Deep Sea Diver boxed sets. I do these by hand and one at a time which obviously takes a while to get quality content gear, box production, etc. In time, I will also sell the boxes alone that you can fill yourself or just display. Below is my Ebay link for one I have up for sell currently. I will also update when more become available, etc. I plan to release a repro box/w contents of the 1966 SOTW German Stormtrooper soon. Stay tuned and feel free to ask any questions.